My little precious has a love-hate relationship with chicken. Sometimes he gobbles it up, especially if I serve it with a dipping sauce, other times he takes one bite and tosses the rest from his tray. As alternatives to roast chicken, I feed him chicken-apple soup and organic chicken-apple sausage. But I’ve been getting bored with these go-to chicken dinners, and I’m sure Mason is too, so I’ve been looking for a new kid-friendly, mom-approved chicken recipe to spice things up. A couple of weeks ago at a birthday party, I found just the recipe. We were celebrating Mason’s friend Lina’s first birthday and her mom, Elif (one of the LIC Mamas), served homemade chicken fingers for the kids–and they were a hit. Golden brown and crisp on the outside, and juicy on the inside, the chicken looked and smelled so delish even the adults were eating it up. Elif was sweet enough to share the recipe with me, so I made the chicken tonight for Mason’s dinner (it took about 10 minutes) and served it with steamed corn and applesauce. Hope your tot enjoys the chicken fingers, as much as mine does. Do you have a chicken recipe that your tot loves? Share it here! Cut chicken breasts into strips and set aside. Beat egg in a large bowl. Place bread crumbs on flat plate. Coat chicken with egg and then transfer to bread crumbs. Heat olive oil in large skillet. Make sure oil is very hot. Slowly place the coated strips in oil until brown, turn over, brown other side. Remove from pan and lay chicken strips on paper towel to soak up any excess oil. Serve immediately. NOTE: I call this chicken fingers recipes healthier because it’s not deep-fried and it uses heart-healthy olive oil. You can also skip most of the olive oil by spraying (or brushing) a baking dish with olive oil and baking the chicken fingers on 350 for about 25 minutes (or until center is no longer pink); broil the last five for a crispier texture on the outside. On Fridays after work Mason and I meet up with a group of neighborhood moms and their babes. I’m so lucky to have met these women: They’re dynamic, talented, and inspiring, my sisters in motherhood. Our kids are all about the same age and we can share any parenting quandary without fear of judgement — we’re all first-time moms who met during those particularly vulnerable postpartum months and we formed a bond. I can count on them. When my nanny had a last-minute doctor’s appointment that conflicted with a mandatory meeting at work, Diane arranged for her nanny to care for Mason. When I failed to find the frozen fruit-holding teether that so many moms think is a miracle, it was Florence who finally found it and bought one for Mason. And so on. Tonight we watched as Zann and Mason entertained sweet, serene Charlotte with their rambunctious little boy antics and we marveled at how big they’re all getting. It’s amazing how much they’ve grown and how miraculous they all are. Today was special for another reason. In addition to enjoying my time with the girls and watching Mason delight in his time with the other babes, today was another one of those days where Mason ate a fun variety of foods, everything that was served to him as well as a little of this and that from our plates. Here’s today’s magic menu. What did your babe eat today? Did he/she try anything new? Dinnertime is our special bonding time. Mason is happy and smiley. We sing , we recite our ABCs, we talk. He’s getting the hang of finger foods so every meal includes some combo of his faves, along with yogurt and a fruit or veggie puree. To change things up, I decided to make soup last night. Mason loves apples and chicken so when I saw this Parents.com recipe for a soup with both ingredients I just had to try it. My variation of the recipe is below. I used ground ginger instead of parsley–I love ginger in chicken soup. Instead of pureeing the ingredients, I chopped the onion, carrot, celery, and chicken into tiny pieces. I mashed the garlic in a garlic press, and I added in frozen corn (a veggie Mason hasn’t tried yet). All the chopping took extra time but it was kinda fun; you can also puree my version of the soup for younger babes. The soup smelled so delish I had a bowl myself. Yum! Try it out — and let us know what you think! *You can also add brown rice or small pasta noodles to this soup, as well as greens such as chopped spinach or kale. 1. Wash, peel and/or chop all veggies and chicken. 2. Heat olive oil in a large pot. Add apple, celery, onion, carrot, and garlic. Cook and stir for 6 minutes. Add in chicken, corn, ginger, and broth or stock. Bring to a boiling, then reduce heat. Simmer, uncovered, until chicken is thoroughly cooked, about 20 minutes. 3. Cool slightly and serve. Or puree soup, in batches, before serving. Freeze leftovers for up to three months. Soup can stay in the refrigerator for up to three days. Mason adores rotisserie chicken. Adores it. We first discovered his passion for it while we were at a friend’s house. Chris was eating takeout roast chicken and he broke off a few pieces and gave them to Bug. Mason is not one to go out of his way to feed himself — the child still refuses to hold his own bottle and you know about our sippy cup woes — so I was amazed when he stuffed the chicken in his mouth as soon as it hit his tray. No coaxing required. And then he reached for more! Finally, a healthy finger food more substantial than puffs and easier to pick up than squishy bits of banana or avocado. Inspired, I picked up an organic rotisserie chicken on the way home from work last night. At home, I cut up the whole chicken and removed the skin. Then I removed the meat from the bones, shredded it into thin, short strips and divided the chicken into two-ounce portions. One portion went in the fridge for Bug’s lunch today and the remaining six went in the freezer for later. Seven portions of a healthy protein for just over $1 per serving (in New York City) — and the entire process only took about 15 minutes! I loved this chicken shortcut because it was healthy and it saved time. It was also so inexpensive! Of course, you can save even more money by roasting your own chicken at home, which I often do, but last night time was more important to me than saving a few bucks. (Mason’s affinity for roast chicken also means no more pureeing chicken, thank God). You can stretch this timesaver to cover your entire family too. If Chris weren’t out of town, I would have whipped up this Dijon-crusted variation with Brussels sprouts for us (it’s one of our fave chicken recipes), then frozen the leftovers for Mason. Dinner doesn’t get much easier than that! What are your favorite dinnertime shortcuts? *This post is the first in my new weekly series about saving time and money on eats for your babe. Hope you enjoyed it! If there’s a topic you’d love to hear about, please let me know. We decided to shake up Mason’s routine Monday night, and that’s how he wound up eating his dinner in the bathtub. I got home from work and instead of playing in his gym or reading books we took a little field trip around our building (it was too cold to go out). Down the hall we went — the light fixtures crack Mason up. Then to the laundry room to check out the dryers. What’s cooler than a bunch of colorful clothes swirling around in a circle? We checked out the new books in the lending library then chatted up Sal, the doorman, in the lobby. On the way back upstairs we stopped by a neighbor’s place to show off Mason’s new slippers. Back home and exhilarated from our adventure, we got ready for Mason’s bath. I’ve never seen a kid who loves his bath more than Mason does. As soon as he sees his tub, he starts cooing and kicking his legs. By the time I’ve actually gotten water in the tub he’s so excited I have to struggle to keep him dive bombing into it. I was just giving him a final rinse when I remembered that Mason hadn’t eaten dinner yet. Damn. Normally he eats much earlier but he had been having a rough day of teething so we decided to give him Tylenol and wait until he felt better. I looked at the clock. Thirty minutes until bedtime — a time we keep consistent since he was sleep trained. I don’t like feeding him so close to bed for fear that he’ll throw up in his crib, but putting him to bed without dinner wasn’t an option. I could get him out of the tub, dry him off, dress him (which he hates), feed him, then do the bath all over again. Or I could just feed him in the tub, then go about our normal bedtime routine. I went the later (easier) route, and we both loved it. As you can see, Mason got to make a mess. The kid is squirmy and it’s a battle to get the food from the bowl to his mouth. 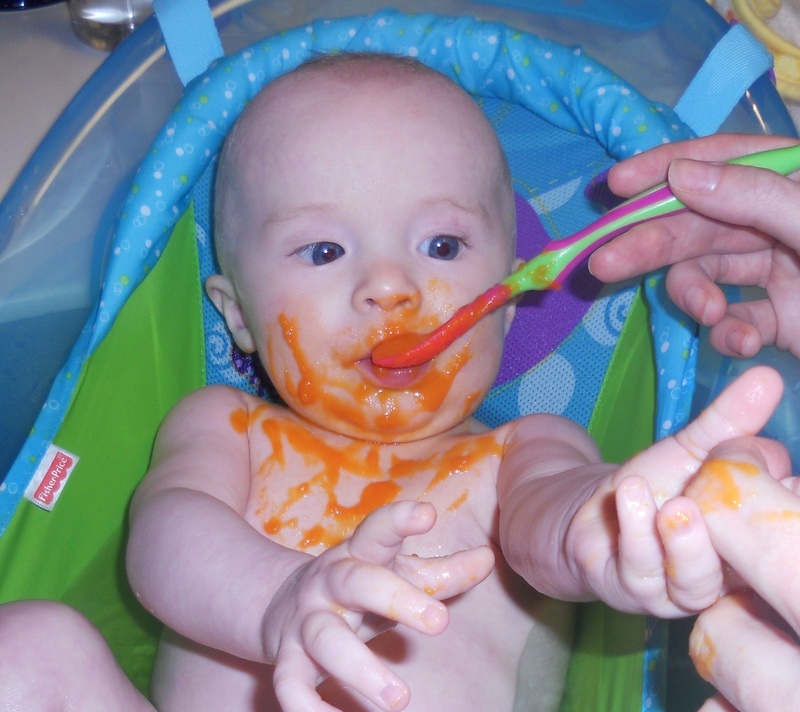 He’ll grab the spoon, fling it and giggle as the food spatters on his clothes, his face, all over the place. Or he’ll grab the spoon, get the stuff all over his hands and smear it as far as he can reach. His meal? YoBaby peach yogurt, Chicken and Carrots, and Apple and Sweet Potato. I got a break from clean up. No high chair mess. No onesie to Shout. A quick rinse and he was clean. I’m not saying we’ll make our bathtub dinners a habit. Dinner has happened on time, in the high chair, every other night this week. But if we happen to find ourselves in the same situation again, I won’t hesitate to feed him in the tub. And you know what? Both of us will enjoy it. What mealtime shortcuts make your life easier?